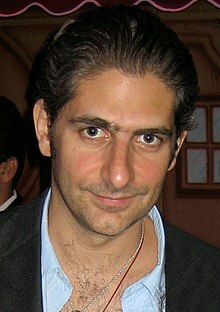 James Michael Imperioli (born March 26, 1966) is an American actor, writer and director. He is best known for the role of Christopher Moltisanti in the HBO drama series The Sopranos. The role earned him a Primetime Emmy Award for Outstanding Supporting Actor in a Drama Series in 2004. He has also had roles in movies and television shows such as Goodfellas, The Addiction, Clockers, Law & Order, Californication and Hawaii Five-0. Imperioli was born in Mount Vernon, New York to an Italian American family. He married Victoria Chlebowski in 1995. They have three children. ↑ "Sopranos Michael Imperioli on his children". People.com. November 26, 2007. Retrieved November 12, 2017. Wikimedia Commons has media related to Michael Imperioli.